In the endo community, we have hands down accepted red meat is terribly bad for us. That’s why so many endo girls are vegetarian or even vegan, because we all KNOW red meat contributed directly to our pain and should be off-limits. Right? Sadly, the information out there is quite misleading and not at all as black and white as “they” make it seem. I would absolutely agree that factory farmed and grain fed animals should be off-limits, not just for your health but also for the sake of animal and environmental welfare! There’s no benefit to any person, animal, or planet in the eating of this type of meat, organic or not. Yet, the truth is that grass-fed meats and organs are some of the most nourishing foods on the planet, meat from healthy animals eating what they were born to eat and living lives they were born to live. These animals will be healthy, their bodies will be full of vital nutrients like omega-3’s (yes, animals eating their natural foods will have omega-3s), CLA, healthy fats, clean protein, and tons of fat soluble vitamins and nutrients hidden in the organs, connective tissue, marrow, and more. When animals are raised properly, the result is a partnership between land, animal, and human. This partnership is one of the most sacred relationships on earth, with the land depending on inputs of manure from the animals for soil health and vitality, the animals depending on humans for protection and care, and humans depend on the animals and land for sustenance and culture. In turn, humans tend and truly care for both animals and land, and when they die, they themselves are returned to the land and their nutrients absorbed into the soil. The circle continues. In this traditional, ancestral, spiritual, and even religious circle of life, there’s no ugly factory farms, fart pollution, environmental or ethical decay, or even heart disease. This is a balanced ecosystem, full of balanced organisms living the way God or evolution (your choice) intended. Yes, there is death. But there is also an abundance of life, and happy lives at that. A truly awe inspiring picture, and one that has allowed humans to flourish in harmony with the earth until, well, rather recently. Yet, this partnership still exists in many places of the earth, and eating foods cultivated in this way will not only offer your body much needed nutrients not found in feedlot animals, but also offer you the chance to support the bounty of the earth through voting with your dollar. 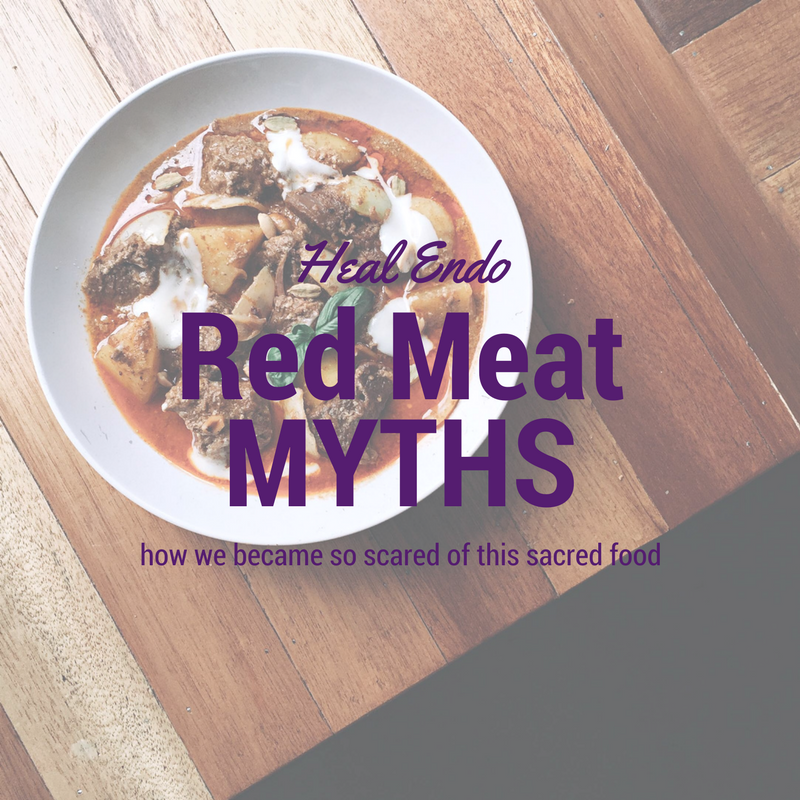 In the following sections, I list out for you the endo myths about why you think you can’t eat red meat, how all meat is not created equal, what to eat, and a section on troubleshooting for those who need help finding good sources, learning to eat organs, or facing either digestive or mental blocks. Take a look through all of them if you want to learn about how certain types of meat can actually begin to heal your body.